To proclaim Inglourious Basterds is Quentin Tarantino’s fourth-best film (ahead of only the indulgent, indolent Death Proof) is not an insult, as each entry in this top quartet exceeds the finest production most directors will ever generate. Still, the film’s relatively relegated status is interesting since Tarantino’s long-rumored World War II flick has been a pet project dating back to his immediate post-Pulp Fiction years. Like all Tarantino movies, Basterds is largely homage, principally – says the director – as a “spaghetti western but with World War II iconography.” There are also overt allusions to so-called “macaroni combat” flicks – the Italian exploitation war movies of the 1960s, 70s and 80s – as well as French New Wave cinema. Of course, there is also Tarantino’s distinctive pulpy, madcap mayhem buttressed by an underlying, underrated maturity. Few filmmakers are afforded the latitude Tarantino enjoys to methodically develop scenes and storylines. This freedom sometimes leads to sequences that are rudderless, drifting on with no discernible payoff. However, it also produces gems like the opening, 20-minute long “Chapter One” of Basterds. 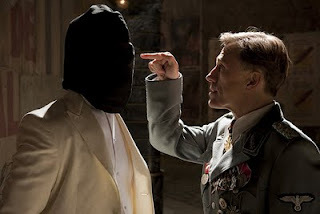 Armed only with guile and a glass of milk, SS Col. Hans Landa, played sensationally by Austrian actor Christoph Waltz in an Oscar-caliber performance, interrogates a French dairy farmer suspected of harboring Jews. The scene reinforces Tarantino’s affinity for Sergio Leone, and it also crackles with QT’s trademark visual and dialogue flourishes. Unlike most filmmakers, the excitement and tension in a Tarantino film largely derives from the fact that you never know how any particular scene will end, and Basterds is no exception. In typical Tarantino fashion, these diffuse plotlines gradually intersect around a blazing, bombastic finale set around the premiere of the latest Nazi propaganda film by Joseph Goebbels (Sylvester Groth), called A Nation’s Pride, which dramatizes on the heroic exploits of a German soldier (Daniel Brühl) who also harbors affections for Mimieux. QT’s love of cinema is the principal sidelight in Bastards, with characters who provide a virtual audio tour through early 20th century Weimar cinema. As in his previous works, Tarantino wrings tension out of the clash of characters with varying class and cultural backgrounds. He distills World War II into one giant race war (not without basis) and takes a baseball bat to Hitler’s vision of the “master race” with irony and volume by conjuring a conspicuously multiculti milieu. American soldiers impersonate Italians; a British lieutenant and film buff (Michael Fassbender) plays a German officer; Mimieux is a Jew masquerading as a Frenchwoman whose lover is her African projectionist. Aldo himself claims to be part-Apache Indian, and the Basterds end up adopting guerilla tactics patterned after Native Americans. Even in the epic opening scene, Landa starts out speaking in French until he and the Gallic farmer compromise by communicating in English. Thankfully, the grotesque use of the Holocaust as a justification for stylized revenge and Tarantino’s brand of comic brutality is largely confined to the film’s second chapter and its misleading trailers. Inglourious Basterds is audacious, entertaining, uneven, and imaginary. It is no “masterpiece,” but it’s far from inglorious.